In the modern world, Tony Brooks might well have been a household name. As it was, he eschewed the limelight in an era when celebrity was reserved for movie stars, but was good enough that team-mate Stirling Moss described him as "the greatest unknown racing driver there has ever been". Brooks started racing in club events before being offered a Formula 2 drive and also some work with Aston Martin in 1955. Near the end of the season he was offered a chance to race an F1 Connaught at the non-championship Syracuse Grand Prix in Sicily, which he duly won. As a result, he was signed by BRM for 1956, making his F1 debut at Silverstone where he crashed, sustaining a broken jaw after being thrown out of his car. He switched to Vanwall the following season, winning the British GP (sharing the drive with Stirling Moss) and finishing second at Monaco. In 1958 he won the Belgian, German and Italian GPs, but he failed to finish six of the other seven races and took third place in the drivers' championship. 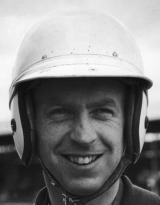 Vanwell's decision to quit F1 led to Brooks signing for Ferrari in 1959, finishing second in the championship after wins in Germany and France. He moved again in 1960, this time to the British-based Cooper team after a hoped-for drive in a new Lotus had failed to materialise, but in an underperforming car only finished on the podium once more in 18 races in two seasons. Brooks could have continued but he was not prepared to do so in cars that he regarded as less than safe. "I felt I had a moral responsibility to take reasonable care of my life," he explained. After quitting motor racing he ran a garage in Weybridge (near the legendary Brooklands circuit) for a number of years, even though, like his father, he was a qualified dentist.